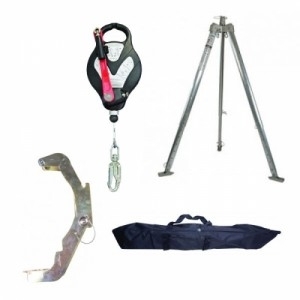 Ridgegear Fall Arrest & Tripod Kit consists of a fall arrest, tripod, bracket and kit bag. The RGR1 Rescue Tripod is portable, lightweight and is easy to erect on site. It has adjustable lower and middle legs at 80mm intervals to adapt and adjust to the most demanding surfaces and varying ground conditions. There are two additional anchorage points ( SWL 200kgs each )on the underside of the head for additional primary / secondary systems.This unit has many applications such as confined access, entry, rescue, retrieval, manhole, silos & trenches, etc. The RGR1 is extremely versitile and is recomended for use with the side attachment of the RGR7 rescue winch and the RGR4 fall arrest & rescue recovery winch. The RGA4B bracket and pin when fitted to the RGR1 tripod enables the RGA4 Fall arrest /retrieval block to be safely attached.